LAST DAY OF THE REINDEER GAMES - TWO GIVEAWAYS - ONE FOR THOSE THAT PLAYED AND ONE FOR THOSE THAT WISHED THEY COULD HAVE! You can find Carroll's here. Caroll has been totally amazing. She has been my babysitter this last two months while I have been in transit and moving. I bet she felt she didn't sign on for that. Thanks Caroll, it has been so fun doing this with you. I would like to thank all of you for coming by and participating. Here is the giveaway, I added a spool of Gutermann thread and two emery boards. This part of the giveaway is for those that actually made reindeer, so I will give those people time to get their pictures on flickr or you can just comment and lead me to your squares or email me. Now the rest of you....you are thinking.... But Barb....I had too much going on to do those Reindeer, too many UFO's and I just couldn't start another project. Well....this next giveaway is for you. 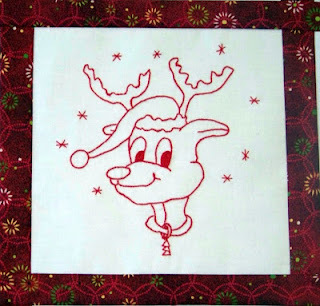 These Charm squares.......just leave a comment, tell Caroll what a fabulous job she did in drawing the reindeer, if you want you can tell me how clever I was to think of the idea (laughing here). Stroke our egos....HA!!! No seriously, just leave a comment. Thanks again, it has been fun! I just couldn’t help myself but make up a pattern of apples. just be sure to size your pattern to the one inch square or just email me and I will be happy to send it right over. Or when you print, just make sure you hit full page. You might just have to email me, so sorry…… it doesn't work, I tried it. So just email me. I dont know what I am going to do about the last Reindeer on Friday, any suggestions? So I showed you this the other day, my memory foam top came in this…. It went from that to this: For sure saving the zipper….can use that in so many projects. This bag is for my son’s girlfriend, she is going to go on a mission for the LDS Church for eighteen months. The circle is: 11- 1/2" in diameter (if you need to know how to make this circle, go here). Then the body measures: 44” wide and 32” long. I used ribbon for the tie, call me lazy….whatever but it worked and saved me some time. Most of you know to sew the body of the laundry bag to the circle first before you sew the side seam or at least that is how I do it…I never completely sew it all the way around, I leave about an inch on both sides unsewn and then I sew the side seam to match what it takes to finish going around the circle…that way it always fits perfectly around the circle. I took a 3 inch hem for the casing, folding it under a half inch. Slit the seam open enough for the ribbon, secured the slit with a straight line stitch at the top for about a half inch and again at the bottom of the slit to keep it from opening up further. Then I top stitched about one-fourth inch from the top just because I could. I put two buttons on the ends of the ribbons to keep the ends from slipping inside the casing and causing her grief on how to get it out and back in again. I just free hand the letters, did a decorative stitch over the top….this by the way is a pocket for her laundry soap or her unmentionables. I see some more in my future. Today I am working on my “Dots to Dots” hop, you can click on the picture on the right and find out the info about it. Then…..I am doing a book review for Ebony…..
and so…. I am saying to myself…. Other than that…not much is going on. My friend JoAnna did come by Friday and spent the night. We stayed up until one playing with my Go cutter (in fact, she ordered her one)…should I feel bad about that? Then Saturday we went to Big Lots…she purchased all of their fabric…. (once again…GUILTY)…..
Then we go to the nearest quilt store and she just went hog wild. She told me as she was checking out that she was going to have to have a long talk with me about my influence on her. I took some gulps…..several gulps…. beads were forming on my forehead… of course, you know I am exaggerating…she did say that but I just laughed. How was I to know that I was going to spark her desire to get back into sewing? I am totally innocent!! Well...just look what it came in. Can you see the wheels turning? Well...today I am going to make something with that round packaging....stay tuned for the results even if it turns out bad I will show you. No worries about the paper it is sitting on, another project in the works. Now for the long overdue part. I received this in the mail when we were actually moving in, boxes were everywhere and life was in total turmoil. What a fun package to get during such a time.....but......I didn't post....so no time like now. I won this over at "Red Quilts", Shelley did a fantastic job and I was so hoping to have it quilted before I posted about it but time is a ticking. 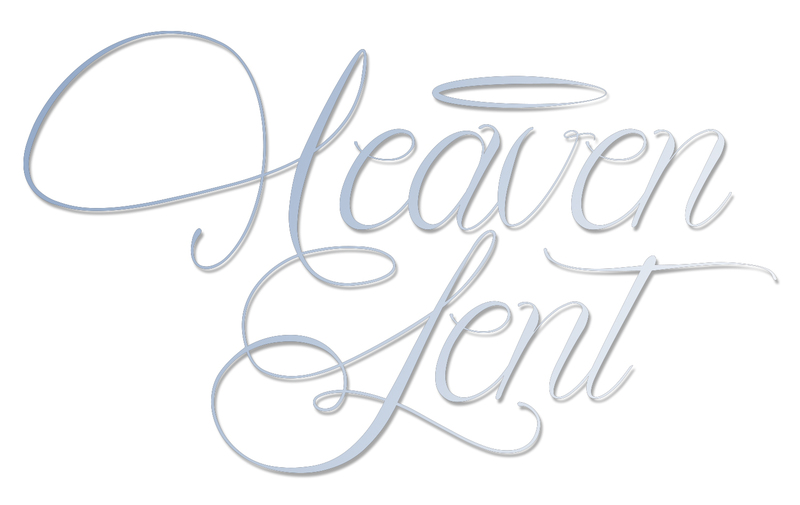 Check out her blog, she is so wonderful but is having her own turmoil and could sure use some quilty support. I wish that underarm wave was as easy to get rid of... Whohoooo So...yesterday I was going to spend the day blanket stitching various projects....hummmm that went out the window. I had so many things fighting for my attention, new ideas....you name it....so...I think I got two flowers blanket stitched and that was it. Oh well...tomorrow (today) is another day! PLEASANTLY SURPRISED WITH THE TURN OUT OF THIS QUILT! but I am pleased with how it turned out and the wave may leave when it is washed. I just did a big meander because like I said, I was not happy with this quilt and felt I was doing good just to finish it.
. So.....I thought....nothing will do my mental health more good than to clean. Now you all think I am sick!!! I love to clean, I love a clean home....that being said...it is not always so because I like to sew more. HA!!!! As I am cleaning I pull out my Norwex supplies, now I have no affiliation with Norwex except that I love it. Why am I telling you this? Because I just cleaned my tub with the Descaler and it looks awesome!!!! I cleaned my stove with the cleaning paste....AWESOME! If you are interested, my friend Linda sells it, you can go here. I guess that makes me affiliated with it since my friend sells it. All that being said....I am now ready to enter the world of the living and not the I want to go back to bed. Here is what I have been working on.....you will see the finished product next month during the "Dot on Dot" blog hop, Sept 10th through 21st....I am on the last day....Quilt Taffy is hosting it for Madame Sam. So...after cleaning the house I walked down to the mailbox and look what was in it. A sweet friend sent me this book, the hardest part is letting it sit instead of me sitting and reading the day away. This quilt is on the bed in the spare room. Notice the pink???? My mother made the quilt and my sister from Average Quilter quilted it...she is getting pretty mean with that longarm of hers. Notice the hand crochet table cloth on the right.....AVERAGE QUILTER!! Yep...she made it. Then today this quilt arrived...this is for my son James, my mother made this and hand quilted it. I have mentioned before that she has made all of her grandkids a quilt and has hand quilted them. She has 24 grandkids and I believe she only has two more quilts to finish. What a long post for someone who is no longer down in the tooth. Have a great day and HAPPY Sewing!! You can find my pdf here. I am a woman of few words today....will be adding a surprise to the giveaway pile! I just wanted to take time to show you all my cutting table. It is an old credenza, it has one drawer and one shelf on the inside. I have all of my scrapbooking in there. The top was misplaced in our last move..... My husband wanted to throw it out. I just couldn't do it....so this is what I came up with. It doesn't look like much but it is on rollers, so I can move it around for convenience. I put a wood shelf plank on the top and as you can see and my rulers are in the side hole where the plank does not cover the opening all of the way. I love it...If I need a ruler, it is just right there for me and I have them in one place. No more hunting for them. I completed this today. I used the scraps from my fandango quilt top (haven't shown yet). This pattern is so fun, fast, and easy. the winner of the fat quarters is Tangos Treasures I just need your address. Thanks so much for all of your comments and for coming by. I didn't respond to most of your comments, been busy running around with our 2 sons that are visiting. One son left this morning...so now I have more time to goof off. Whohoooooooooooooooooooooooo!!!! Here is where I am at on the puzzle. My husband came in the room the other day and sat down to work on it. Now....he doesn't do puzzles and he doesn't know puzzle etiquette. I saw him eye balling my section. So....I took my hand, waved it over the little section I was working on and said....you can work on any part of this puzzle but right here. You never invade someone's space when doing a puzzle. So....the next thing I knew he found the very piece I was looking for.....He was so pleased he almost jumped for joy..... Hummmmmmm my comment to that is... he doesn't play well with others and doesn't follow rules. Now...I want you all to look at this fabric and the price....can you guess where I purchased this? so....I want to share the find, I will give one winner the choice of either fat quarters. Not giving the roll away..sorry. So just leave a comment and let me know which one you would like. Upon leaving Virginia a real sweet friend gave me this puzzle. This is me whinning here...."This is without a doubt one of the hardest puzzles I have ever put together!" Is she secretly laughing in the corner? With each piece comes a new fabric and I think to myself...oh...I want that fabric....or that one. So....if I go missing for a while, you know where I will be....why not come over and put a piece in yourself? DAY LATE AND A DOLLAR SHORT!!! This picture is what I am doing with some left over fabric from the fandango line. I just finished a top and I loved the fabrics so much that I am making a round runner. Haven't had much sew time with sons visiting but they are going away for the week-end....so maybe ????? 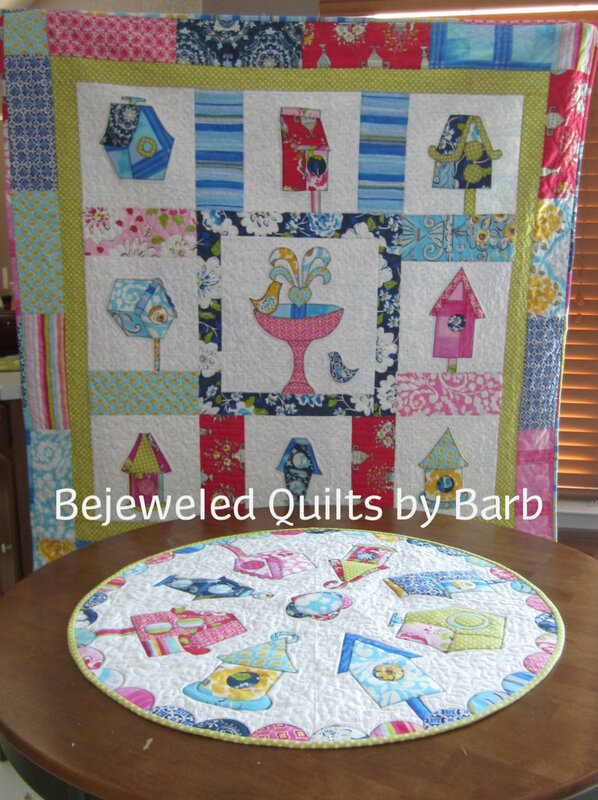 I was so impressed with "Charlie, Dee, and Me" blog, she had a post where she was determined to use every scrap of fabric she used for a quilt. I want to do that....I want to be able to say....I have no more. But....that "AINT" happening....but I can always dream. Talk about a cute blog.....go check her out...just adorable. I am having computer issues...I have given on commenting .... some I can come I can't, the page turns white, can't scroll...very frustrating. Just so you know why I haven't been by. Soooo I told my sister that I would wait for her to put this pattern in her store...... I didn't really tell an untruth...well....gosh sakes.... I can't wait until tomorrow...tooo excited. So you get two patterns (this pattern is 20 pages long)....oh my stinking gosh!! I can't even believe it myself. I was very very worried but when it saw it finished, his eyes lit up....he is my person I go to for critiques and when he doesn't like something I get worried. This was so fun to watch come together. Now my son Nathan didn't like how I had the poles situated on the birdhouses but I told him that I tried to center them but it just didn't look right....so my comment is....if you do this pattern...."Do it your way! ".....it is your party and you can do what ya want. Oh...and don't you just think if you chose three birdhouses that it would be a cute wall hanging? Or rectangle runner...yes...I was going to do a rectangle runner but ...well...I want to go on to other things. You know me and staying focused.....I can only hold my attention span so long and then I am off again. my son is hiding behind that quilt....HA!!! So to one person I will give this pattern , it is pdf so I can send it right over. Just leave a comment and I will chose a winner when Jeanette gets the pattern in her store, so probably tomorrow night I will chose a winner. As you see above, I am adding 1/4 yard of reindeer fabric, which gives you 2 yards of the blue snowflake, little reindeer, reindeer trim, reindeer Christmas Cards, reindeer towel, and then the 1/4 yard reindeer fabric. This is so fun picking things out for this giveaway. I do hope you join us on flickr and continue to follow the progress of those that have joined us. Now for the winner of my five fat quarter giveaway…. Thanks to all of you who joined in on this giveaway, sorry if I didn’t respond back to all of you.